These ultrasonic recordings of Vespertilionidae bat echolocation calls were made in the summer of 2011 using a CDB101R3 heterodyne stereo bat detector and a Tascam DR-100 digital recorder. The recordings were made in Parc de la Ciutadella in Barcelona. Many overlapping pulse trains indicate groups of low flying bats feeding on insects – often just a few centimetres above head height. Those sections in which pulses do not overlap feature isolated bats flying in circles of about 15 meters in diameter. The frequency range of calls lies approximately between 35-60 KHz, and in some sections it is possible to hear other sound sources such as crickets, footsteps, people talking, or the fountain where the bats catch their prey. MSSBH began life as a turgid short story, written in an attempt to prove that a certain brand of screenwriting software was actually crap. It was, and so was the story, which no one would read, regardless of the amount offered. This new presentation, however, is bound to be the smash hit on radio I have always wanted. A little known fact about this piece is that it is entirely composed of birdsong, painstakingly recorded and edited, stretched, squeezed, modified, and modulated to sound like "synthesizers," "drums" and even "a narrator." Even more amazing is that it consists only of the songs of common sparrows found outside my window when I am feeling melancholy. Perhaps the most startling, amazing, and downright awesome wicked aspect is that encoded in between the birdsong are secret subliminal instructions, which if all goes according to plan, will mobilize a good quarter of the listening audience (+/- 12% standard deviation) into my zombie apocalypse army. WHICH YOU CANNOT STOP. Change Your Mind by Paramananda was one of the best-selling meditation books produced by the FWBO. Paramananda's considerable experience of meditation and in social work led him to an approach to sitting practice that tried to take account of the whole person, body and 'soul'. Judging by the popularity of his teaching he seems to have hit on something vital to forming an enduring positive relationship with meditation as a way to transform your sense of self and of life. Paramananda recorded taped audio guides to meditation for Dharmachakra in 1998, intended to complement his book. Throughout the month, Radio Boredcast is making selections of themed music that fit the As Slow As Possible subject, either in an obvious or more ethereal way. What I like about the raga is it is a series of notes arranged and rearranged in very methodical ways, reflective of the time of day, the season, and so on... very much in tune with the theme of Slowness in that it reflects time and repetition. Getting lost in a swirl of words in a variety of languages, real and otherwise. Words spoken, declaimed, sung, monologues, shaggy dog stories, childhood reflections. For this hour of the Boredcast, I’ve selected fifteen slow-moving songs or pieces centered on the human voice, sometimes a cappella, sometimes with drone, ambient or otherwise low-key or understated accompaniment. All of these pieces have roots in traditional music or contain traditional elements from Europe and Asia. But many blend elements of the traditional and the modern; with the exception of the selection from Buddhist monks in Bhutan, none of these are not ethnographic field recordings. Rob Weisberg is the host of Transpacific Sound Paradise, the “peerless world music show” (Time Out New York) heard Saturday evenings on non-commercial radio station WFMU. The program features recorded and live music, interviews, and remote broadcasts from Barbes, a performance venue in Brooklyn and occasionally other venues. The noted abstract painter Mary Heilmann was inspired to name one of her works after the show, Transpacific (2007) and Rob’s voice from the show has been heard in two documentary films. Rob’s obsessively-maintained online world music calendar has become an essential resource for NYC metro area world music fans. Jem Finer has made Radio Boredcast four 6-hour recordings of Longplayer to broadcast this month. Longplayer is a one thousand year long musical composition. It began playing at midnight on the 31st of December 1999, and will continue to play without repetition until the last moment of 2999, at which point it will complete its cycle and begin again. Conceived and composed by Jem Finer, it was originally produced as an Artangel commission, and is now in the care of the Longplayer Trust. Longplayer can be heard in the lighthouse at Trinity Buoy Wharf, London, where it has been playing since it began. It can also be heard at several other listening posts around the world, and globally via a live stream on the Internet. Longplayer is composed for singing bowls – an ancient type of standing bell – which can be played by both humans and machines, and whose resonances can be very accurately reproduced in recorded form. It is designed to be adaptable to unforeseeable changes in its technological and social environments, and to endure in the long-term as a self-sustaining institution. Jem Finer is a UK-based artist, musician and composer. Since studying computer science in the 1970s, he has worked in a variety of fields, including photography, film, experimental and popular music and installation. Among his other works is Score For a Hole In the Ground (2005), a permanent, self-sustaining musical installation in a forest in Kent which relies only on gravity and the elements to be audible. He is currently working on a number of new projects continuing his interest in long-term sustainability and the reconfiguring of older technologies. 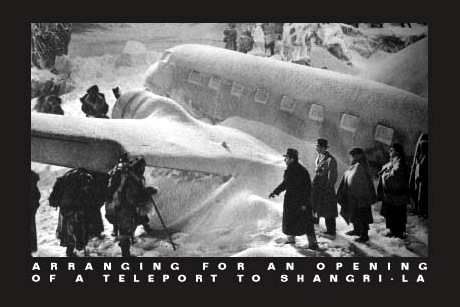 An attempt to open a teleport to Shangri-La. It was Christmas Eve and I was twelve years old. I had gone with my family to the country house to celebrate Christmas. It was cold and there was a lot of snow that year. We hardly ever spent Christmas at the country house, it was too uncomfortable, too much of a hassle to keep the fireplace and the tiled heaters going, but this year the grown-ups had decided that we were going to anyway. A lot of effort went into preparing Christmas: the food, the decorations, the presents – everything! We endured the ritual despite the lack of comfort and, late at night, sat down to watch TV. An old black-and-white film called ‘Lost Horizon’ was on. I settled into my chair, my expectations weren’t particularly high, but what else was there to do in this primitive situation. The grown-ups were busy with something, trying to keep spirits high. I became absorbed in the film, which got increasingly interesting as it developed. It was set in China in 1935, with the Japanese invading the country and a group of Americans trying to flee the country in a refugee plane. Once they are airborne it turns out that the plane is being piloted by Asians and headed for an unknown destination. It ends up crashing in a Tibet-like area, high up among snow-clad mountains. The Western passengers survive, while the Asian pilots die in the crash. Dressed only in hats, coats and dresses, the survivors try to get to grips with their icy predicament. Disaster seems threateningly close. Pretty soon, however, a group of fur-clad natives turns up. They appear to know what they’re doing, and offer to help. The prospect of a monastery, not too far away, beckons. A long, dangerous and difficult journey begins. The wind and snow beats against their faces, dangerous precipices suddenly appear, avalanches lie in wait. The group makes it around a windswept rocky outcrop, like a threshold, a passageway, and suddenly a protected valley appears, a virginal place where the sun always shines and everything is all right. The enraptured Westerners, feeling happy and safe, look down over the wonderful place, a place called Shangri-La – but here my watching abruptly ends. Having been totally absorbed by the film, I haven’t noticed that the rest of the family has been discussing our stay at the country house and their worries about it; now they have packed everything again and are about to return home to the civilization. The TV is turned off, I have no choice but to head out to the waiting, heated cars and leave. I am deeply disappointed. I would really have liked to see the end of the film, but there is nothing I can do. Twenty-four years later I got the chance to see the whole film: it was again being shown on TV, and this time I was better prepared, more in control of the circumstances. I found out that ‘Lost Horizon’ was a film by Frank Capra, from 1937 (based on a novel with the same name from 1933 by James Hilton). It was a bewildering experience finally to see it to the end, after all those years. I have seen it again countless times since. I haven’t been able to let go of it, there is a connection between the film and my life, a connection between a certain scene in the film and a certain occurrence in my personal history, there is a parallelism, a threshold value. There is also, in the film, a dream as old as humanity, realized for the screen in a gigantic cold-storage space outside Los Angeles. The dream of a place, a condition, in which good is made manifest and offers security, shelter and solace amid the existential angst of the everyday. What remains as the crucial moment in the film is of course when the small group of people crosses the threshold to Shangri-La, when the windblown life on the other side is exchanged for the calm and warmth that envelops them when they have crossed over, passed the rocky outcrop. It is, of course, the most important moment in the film, the most important moment in life. The crossing, when the transformation happens. This has not left me any peace of mind, and in various contexts I have returned to this image of the passageway, the threshold, as a starting point, and in this case as an existing model in a Hollywood production. When I am now making what I call an attempt to open a teleport to Shangri-La, I am using the film and its story as a starting point. Can we use these basic aids to bring about a breakthrough? Art is a universal and amazing tool with whose help we can make miracles happen. FROM ONE ROOM TO ANOTHER. To create the basic conditions for a transition. The source material is Frank Capra’s film ‘Lost Horizon’ from 1937. Using lyrics and themes from the other three episodes, ‘Hocket’ deals in deals with what is commonly known as ‘singing in the round,’ except that it is a vocal performance recorded only once to cassette tape with a dictaphone which is then used as a playback device for a double-tracked, manipulated recording. Strictly speaking, the resulting form is closer to canon, but when Gwilly started he was under the impression that canon and hocket were the same thing; he kept the working title because he liked the word better and, of course, it resists connotation. Doug Horne has been doing free-form radio and dabbling in audio art for the last 27 years at the radio stations CHRW, CKMS, and CFRU in Ontario Canada. His most curious achievement was curating the long-running and completely unknown audio-art show "Frequent Mutilations" on CKMS until it was over-run by cretin hordes in 2008. He has carried on audio art-based radio with the collaborative long-distance show "The Mannlicher Carcano Radio Hour" (his portion originating from CFRU in Guelph, Ontario). In his spare time Doug is an academic librarian who lives with his family and 8 chickens in a shack surrounded by sculptures made of rusty metal, and hopes one day to have an old car on blocks in his yard.